On the 2nd (Fri), stroll through Niagara Gorge Trail, then Head underground at Cave of the Winds, and then take in the dramatic scenery at Niagara Falls. Keep things going the next day: take in the dramatic scenery at Bridal Veil Falls, then head off the coast to Three Sisters Island, and then enjoy breathtaking views from Niagara Falls Observation Tower. For where to stay, traveler tips, more things to do, and more tourist information, read Niagara Falls attractions planner . Geneva, Switzerland to Niagara Falls is an approximately 16.5-hour combination of flight and train. You can also do a combination of flight and bus; or do a combination of train and flight. The time zone changes from Central European Time (CET) to Eastern Standard Time (EST), which is usually a -6 hour difference. August in Niagara Falls sees daily highs of 31°C and lows of 19°C at night. Finish your sightseeing early on the 3rd (Sat) to allow enough time to travel to Chicago. Kick off your visit on the 4th (Sun): admire the masterpieces at The Art Institute of Chicago, admire all the interesting features of Millennium Park, and then admire all the interesting features of Wrigley Field. On the 5th (Mon), you'll have a packed day of sightseeing: engage your brain at Museum of Science and Industry and then look for all kinds of wild species at Cowles Bog. To find other places to visit, ratings, where to stay, and tourist information, refer to the Chicago attractions planner . Traveling by combination of bus and flight from Niagara Falls to Chicago takes 5 hours. Alternatively, you can do a combination of train and flight; or drive. The time zone difference moving from Eastern Standard Time to Central Standard Time is minus 1 hour. Traveling from Niagara Falls in August, plan for somewhat warmer nights in Chicago, with lows around 22°C. Finish your sightseeing early on the 5th (Mon) to allow enough time to drive to Indianapolis. Kick off your visit on the 6th (Tue): take in the architecture and atmosphere at Saint John Evangelist Catholic Church, explore the engaging exhibits at Children's Museum of Indianapolis, then examine the collection at Indianapolis Motor Speedway Museum, and finally look for all kinds of wild species at Sodalis Nature Park. Get ready for a full day of sightseeing on the next day: admire nature's wide array of creatures at Indianapolis Zoo, then explore and take pictures at Victory Field, then enjoy some diversion at Hinkle Fieldhouse, and finally test your team's savvy at popular escape rooms. To see traveler tips and more tourist information, read Indianapolis route builder site . You can drive from Chicago to Indianapolis in 3.5 hours. Alternatively, you can fly; or take a bus. You'll lose 1 hour traveling from Chicago to Indianapolis due to the time zone difference. Expect a daytime high around 34°C in August, and nighttime lows around 21°C. Finish up your sightseeing early on the 7th (Wed) so you can travel to Charlotte. Kick off your visit on the 8th (Thu): get curious at Discovery Place Science, then browse the collection at Billy Graham Libary, and then examine the collection at NASCAR Hall of Fame. Find out how to plan Charlotte trip without stress by asking Inspirock to help create an itinerary. Getting from Indianapolis to Charlotte by flight takes about 4 hours. Other options: drive; or take a bus. In August in Charlotte, expect temperatures between 36°C during the day and 24°C at night. 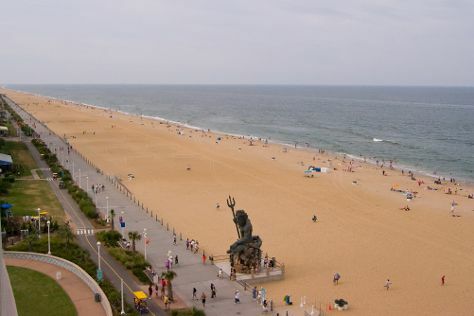 Wrap up your sightseeing on the 8th (Thu) early enough to travel to Virginia Beach. Start off your visit on the 9th (Fri): don't miss a visit to Cape Henry Lighthouse, tour the pleasant surroundings at Virginia Beach, and then take a leisurely stroll along Virginia Beach Boardwalk. To find reviews, photos, more things to do, and tourist information, go to the Virginia Beach attractions planner . Traveling by combination of flight and taxi from Charlotte to Virginia Beach takes 3.5 hours. Alternatively, you can drive; or do a combination of flight and bus. In August, daily temperatures in Virginia Beach can reach 35°C, while at night they dip to 26°C. Finish your sightseeing early on the 9th (Fri) to allow enough time to drive to Williamsburg. Kick off your visit on the 10th (Sat): steep yourself in history at George Wythe House, take in the architecture and atmosphere at Bruton Parish Episcopal Church, contemplate the long history of Governor's Palace, then step aboard Jamestown Settlement, then take an in-depth tour of Historic Jamestowne, and finally savor the flavors at Silver Hand Meadery. On your second day here, find something for the whole family at Busch Gardens Williamsburg. To see ratings, more things to do, reviews, and tourist information, refer to the Williamsburg trip builder tool . Drive from Virginia Beach to Williamsburg in 1.5 hours. Alternatively, you can take a bus; or take a bus. In August, daily temperatures in Williamsburg can reach 37°C, while at night they dip to 24°C. Finish up your sightseeing early on the 11th (Sun) so you can go by car to Chincoteague Island. Kick off your visit on the 12th (Mon): explore the striking landscape of Chincoteague National Wildlife Refuge. On the 13th (Tue), you'll have a packed day of sightseeing: see what you can catch with a fishing tour and then get a dose of the wild on a nature and wildlife tour. For more things to do, where to stay, traveler tips, and other tourist information, refer to the Chincoteague Island road trip planning tool . You can drive from Williamsburg to Chincoteague Island in 3 hours. Another option is to take a bus. When traveling from Williamsburg in August, plan for little chillier days in Chincoteague Island, with highs around 34°C, while nights are about the same with lows around 23°C. Wrap up your sightseeing on the 13th (Tue) early enough to travel to Philadelphia. Kick off your visit on the 14th (Wed): admire the local landmark of Longwood Gardens, admire the masterpieces at Philadelphia Museum of Art, and then get a sense of history and politics at Independence Hall. Get ready for a full day of sightseeing on the next day: get engrossed in the history at Eastern State Penitentiary, then explore the world behind art at Barnes Foundation, and then appreciate the extensive heritage of Independence National Historical Park. Discover how to plan a Philadelphia trip in just a few steps with Inspirock's itinerary builder. Traveling by combination of taxi and flight from Chincoteague Island to Philadelphia takes 3.5 hours. Alternatively, you can drive; or do a combination of taxi, bus, and train. Expect a daytime high around 34°C in August, and nighttime lows around 24°C. Finish your sightseeing early on the 15th (Thu) so you can take a bus to New York City. Step out of the city life by going to Narwhal Yacht Charters and Bronx Zoo. Do some cultural sightseeing at The Metropolitan Museum of Art and American Museum of Natural History. There's much more to do: make a trip to Central Park, pause for some photo ops at Statue of Liberty National Monument, pause for some serene contemplation at St. Patrick's Cathedral, and steep yourself in history at 9/11 Memorial. To find ratings, photos, and tourist information, refer to the New York City trip planner . Take a bus from Philadelphia to New York City in 1.5 hours. Alternatively, you can take a train; or drive. In August, plan for daily highs up to 34°C, and evening lows to 25°C. Wrap up your sightseeing on the 20th (Tue) to allow time to travel back home.